Today is the end of my second month in Bangkok. Time flies! Coincidentally, today is Malaysia’s 51st Merdeka Day (Independence Day). It makes me think of what would I be doing if I was in KL today. Perhaps nothing special, as every Merdeka Day is just another day for me to rest and do things with my family or friends. Somehow, being away from Malaysia makes me miss home (just a little bit more than usualJ) on this specialy day. What I miss most besides my family and friends is Malaysian food. Me being in Bangkok, one would think that I have the advantage of enjoying Thai food everyday. Yes, I admit that at first I was excited to be trying different types of spicy Thai food. I still enjoy eating Thai food. But the truth is, after a while, I crave for food that can comfort my heart and soul. That is Malaysian food. I really miss Malaysian food. I miss nasi lemak, roti canai, teh tarik, jawa mee, mee goreng, maggie goreng, pork noodle, prawn noodle, curry noodle, cendol, chee cheong fan… etc… There is so much food to be listed. It also happened when I was living in the USA. But somehow, this time I miss Malaysian food more than before. Malaysia has so many varieties of food and flavours thanks to contributions from all different races in Malaysia. 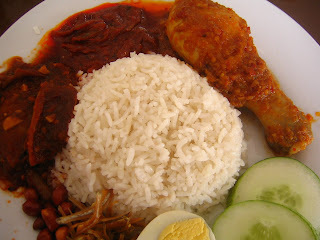 When I think of Malay food, I think of nasi lemak, rendang, satay, and etc. It is hot and spicy that challenges our taste buds. Then, we also have another spicy food from our Indian community. I miss roti canai, roti telur, curry rice served on banana leaf, teh tarik, cendol and etc. I really miss mamak stall that is always there for us whenever we need it. 24 hours a day, I can always find one around the corner to fill up my stomach whenever I am hungry, or just to hangout and chat with friends over teh-o-ais-limau (iced lime tea). In Bangkok, there is no place like this to hangout with friends unless you go to a bar and have some beer. Last but not least, I always miss the taste of chinese food. There are so many types of noodle to choose from. Whenever I go to a hawker center in Kuala Lumpur, I always have take a long time to decide what to eat. There are always so many choices but my stomach can only take so much. The popular chinese food include wantan noodle, curry noodle, pork noodle, pan mee, yee mee, chicken rice, yong tau fu, chee cheong fan, and etc. And these are only the tip of the iceberg when it comes to Chinese food. There are always something new to be discovered. Most of all, I miss home cooked meal that I used to eat at home every evening. Home cooked meal has its unique flavour that we can’t buy from any restaurant. My aunt is the person who is responsible for my family’s dinner every evening. I miss her cooking. She made the best ‘woo-tao-gou’ (yam cake) that I have ever tasted. Her ‘bachang’ (triangular sticky rice), veggie bao, and ‘chap-chai’ (mixed vegetable stew with roasted pork) are also famous around my neighbourhood. I want to learn to cook from my aunt. But i just never had the time to do so when I was in K.L. Now that I am in Bangkok, it is even more difficult to learn from her. My mission now is to find a good Malaysian restaurant in Bangkok. But nobody seems to know where if there any Malaysian restaurants here. I guess Malaysian food is not popular. So, is there anyone who is reading my blog, interested in opening a Malaysian restaurant here? I will be your first customer! Don't worry, you will be back soon and we'll go eat eat eat, ok? Hey ko, I introduce a nice bloggie to u~~ (misss22.blogspot.com) This blog is about a Malaysian stay over Japan. Hey, really impress with people that creates blogs or such IT / hi-tech related things (to me at least)...... I'm such an "unIT" & "untechnologically" person. Kesian Wei Khean...You know, that is the most difficult thing for a malaysian living abroad...the food! here we have all sorts, chinese, indian, malay, western including european, etc. so many flavours, so many colours. i can so understand how you feel and i don't envy you one bit. It is more difficult for a muslim coz the choices are narrowed down!!! anyway, you aren't that far away and as Ken said, you can always get on a cheap air asia flight!! !